Approximately 70 students, faculty and staff lined the Arnold Bernhard Library steps from 11:45 a.m. to 1 p.m. to participate in a silent vigil, put together by a group of faculty and students. 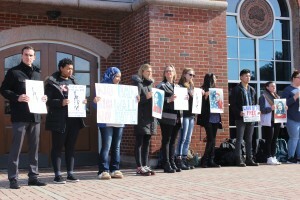 The silent vigil gave members of the community an opportunity to stand in solidarity with immigrants and refugees who have been affected by President Donald Trump’s executive order to ban against immigrants from Iraq, Iran, Libya, Somalia, Syria, Sudan and Yemen from traveling to the United States. Assistant professor of English Kim O’Neill passed out pamphlets with information on the executive order, how members of the community can learn more and help take action against the ban. President of Muslim Student Association (MSA) Ayah Galal said the flyers were passed out to educate passersby on the executive order and clear up any misconceptions people may have. O’Neill was proud of the students and faculty for coming together and showing how much they care about the issue. Galal is pleased with the turnout of the vigil and said she is participating because she thinks the executive order is un-American. 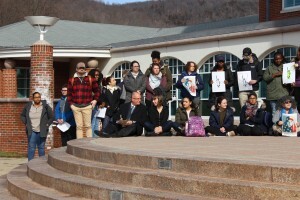 Many prominent figures from the university participated in the vigil as well, such as Vice President and Provost Mark Thompson, Rabbi Reena Judd, Father Jordan Lenaghan and Associate Vice President for Academic Affairs and Chief Diversity Officer Diane Ariza. Members of the Department of Public Safety, including Chief of Public Safety Edgar Rodriguez, also attended the vigil. For Ariza, the vigil was an opportunity to show the community coming together on in support of the Muslim populations that have been affected by the ban, as well as refugees. Thompson said it is important the university shows support for those affected by President Trump’s executive order. Student Government Association Senior Class Representative Chris Desilets participated in the vigil and said this executive order hits close to home for him since his mother immigrated to the United States. Assistant Professor of Anthropology Julia Giblin said she participated in the vigil to show support for students and faculty on this campus affected by the ban. 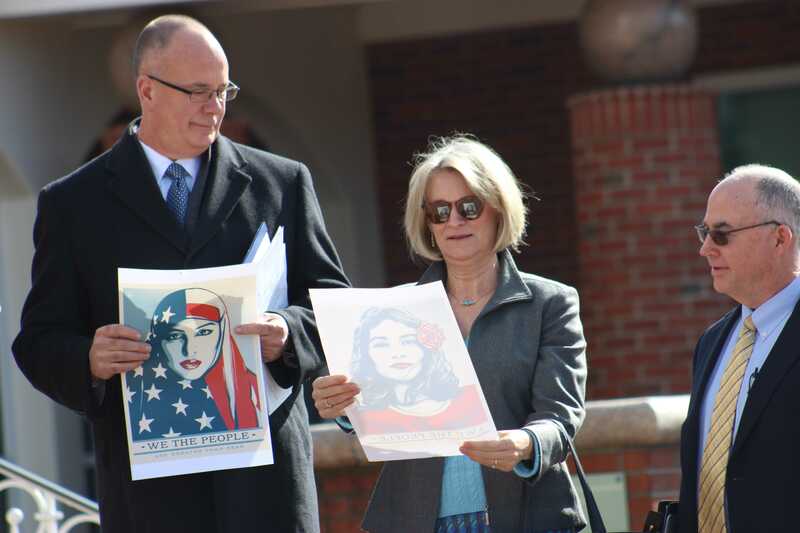 “I wanted to be here to support faculty and the students on campus who are feeling worried or threatened about this executive order and how it impacts people in our community who may not be protected,” Giblin said. Sophomore Caroline Sullivan was walking by the vigil and eventually decided to participate. She thinks the protest is great because it is peaceful and respectful which is appropriate for a college campus. 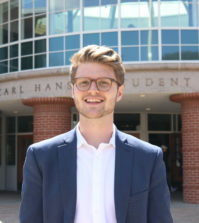 Giblin said that the vigil demonstrated how the faculty and students care about one another and show that there is hope when we all get together. “I wanted to promote thinking about understanding and openness versus exclusion and building walls or bans on people who enter the country,” she said.